Arguably, there hasn’t been a bigger staple in Christian music in the last 25 years than the Newsboys. They’re not quite the ‘boys from down under’ anymore but they continue to be at the forefront of CCM music. But the Newsboys weren’t always the big act that they are now. They started in the land of Australia in the mid 80’s and soon moved to the United States. The two names that most avid Newsboys fans know from this particular era are Peter Furler and John James. Despite signing a record deal, the Newsboys’ first 3 albums (“Read All About It”, “Hell is for Wimps”, “Boys will be Boyz”) garnered little attention from the radio. In 1992, the Newsboys released “Not Ashamed” record. This album’s title track was the band’s first big radio hit. Besides the the title track, the album featured 5 other successful radio hits. Notably, one of these hits featured a worshipful rendition of “Turn Your Eyes upon Jesus” which will be covered by the current Newsboys’ lineup on their upcoming hymns record coming out November 4th. This song was almost a prequel to many great Newsboys worship songs that would be released in the years to come. But before the Newsboys were known for great worship songs, they were known for edgy rock with insightful lyrics. A lot of that had to do with the Newsboys partnering with Steve Taylor. As Steve Taylor’s musical career began to wind down, he used the Newsboys as an outlet for some of the greatest lyrics in CCM history. This partnership was paramount to the Newsboys becoming the staple that they were. Following “Not Ashamed”, the Newsboys released “Going Public”. This record would feature the smash hit “Shine” which propelled the Newsboys to become headliners in the Christian music world. This record proved that the Newsboys were here to stay. 8 of the 10 tracks on the “Going Public” record made it on to radio. 4 of the tracks, including “Shine“, were number 1 hits. It was during this era that we saw the addition of Phil Joel, Duncan Phillips, Jody Davis, and Jeff Frankenstein. Phillips, Davis, and Frankenstein remain in the band to this day (Although Davis did take a break in the mid 2000’s to tend to a family matter). When longtime Newsboys fans talk about the “Newsboys sound”, this is the era they tend to talk about. Although 75% of the current lineup has been with the band for 20 years, many fans talk about how the current Newsboys “aren’t the same”. There are many reasons for this that we will discuss later on in this article. The last record of the John James era was “Take Me To Your Leader”. It was during this era, because of the emergence of other great bands such as dc Talk and Audio Adrenaline along with the Newsboys, that the Christian rock genre became big enough to maintain radio stations targeted to that particular fan base. Because of this phenomenon, the “Take Me To Your Leader” record saw 10 of it’s 11 tracks played on radio. This record included one of the biggest Newsboys fan favorites of all time: Breakfast. 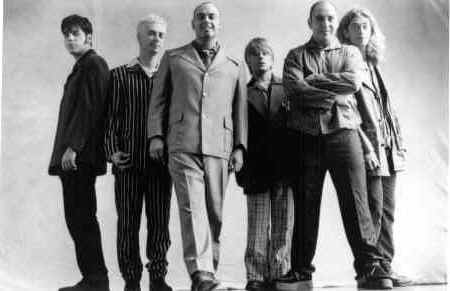 Step Up to the Microphone was the first record of the Peter Furler-as-lead-vocalist era. This record was not as edgy musically as the last few records but maintained the same thought provoking lyrics. “Entertaining Angels” (which is in my personal top 10 songs of any band) may have been the segue to the next generation of Newsboys’ music that resembled more of a radio-friendly CCM sound. But before the Newsboys jumped into the worship genre completely, they turned back the clock. The band released “Love Liberty Disco”, a record that is a 1970’s throwback. If anything, “Love Liberty Disco” showcased the band’s creative ability. The Newsboys had been known for years as an amazing band to see live. It was during this time that fans of the band will remember the “Airdome tour” where the Newsboys brought their own blow-up venue on tour (although many times unsuccessful due to weather). The “Thrive” record saw a handful of hits, most notably “It Is You“. “It Is You” was the beginning of an era for the Newsboys that saw two worship albums back to back: “Adoration” and “Devotion”. This worship era saw “He Reigns“, “You are My King”, and “Blessed Be Your Name”. More than ever, the Newsboys became radio friendly. Arguably, they released these worship records before worship became the popular CCM genre that it is today. Many wondered if the Newsboys’ days of edgy music was over. 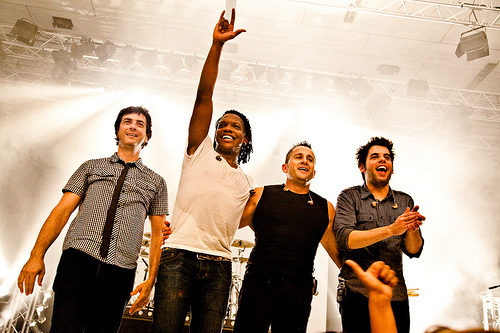 In 2006, the Newsboys returned to the rock ‘n roll sound that made them so popular. The band released “Go”, a record that reminded longtime fans of that “Newsboys sound” that they fell in love with. This record was bittersweet for many fans because soon after longtime Newsboy Phil Joel announced his departure from the band. 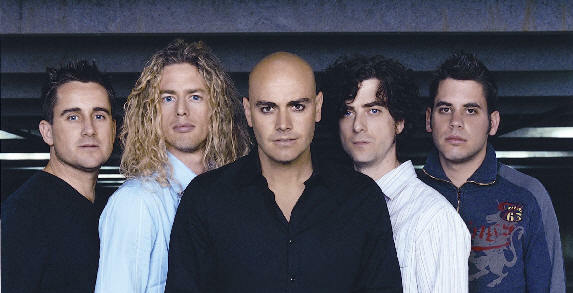 Three years later, Peter Furler announced his farewell from the band shortly after the release of the “In The Hands of God” record. Rumors of the Newsboys breaking up were soon put to rest when the band announced that former dc Talk-er Michael Tait would take over lead vocalist roles. The band’s first release with Tait was appropriately named “Born Again”. It was apparent under this new era that the Newsboys’ sound would continue to evolve. Many longtime fans, as mentioned before, complained that the band’s sound was not the same. All fans need to do is listen to the first and last record of each lead vocalist’s era. The Newsboys’ sound on the first and last John James record was completely different. In comparison, the Newsboys’ sound on the first and last Peter Furler record was different as well. The Newsboys never sounded the same for more than 2 records at a time throughout their history. Arguably, this is why the band has stayed relevant for so long. Being able to evolve has gave the band staying power. Both “God’s Not Dead” and “Restart” were commercial successes with Tait as the lead singer. Each record boasts number 1 hits. “God’s Not Dead” proved that Tait could follow Furler’s footsteps in the worship genre. And Restart also proved that Tait, like Furler, could make a good pop record. Now the Newsboys will once again return to their worshipful side. On November 4th, the band will release their 17th studio album “Hallelujah for the Cross”, a record full of classic hymns. It’s hard to tell how many chapters remain in the Newsboys saga. But it’s hard to deny that the band remains at the forefront of CCM and their live show continues to be one of the best. This entry was posted in art, Christianity, Music, worship and tagged audio adrenaline, dc talk, newsboys, steve taylor. Bookmark the permalink. Tait never fronted Grammatrain. He did collaborate with Pete Stewart (lead singer of Grammatrain) on both of their solo projects. Pete even toured with him for a bit. Petes solo album, as a side note, was one of the most solid efforts of the 2000s by any Christian artist. I understand what you are saying. But like I said in the article, they AREN’T different bands. 75% of the Newsboys have been there for 20 years. Those guys have worked hard to build the brand of the Newsboys and I think they deserve the option of keeping the name. Early John James era sounds COMPLETELY different than late Peter Furler era and nobody says anything about that. Bands evolve. I loved the movie “God’s Not Dead” and I fell in love with the Newsboys when they sang their song. This was my introduction to them. I love the Christian–worship type of music especially. [Keep up the great worship songs guys.] I enjoyed your article, Gabe. That movie was surprisingly good. Maybe because I had zero expectations going in to watching it. But I was impressed. There will always be some opposition from fans/listeners when a known member leaves a band and a new one comes on board. Michael Tait came on board after Furler stepped down. He wasn’t asked to leave. Tait brought new life to an already established group of talent. Is it different? Yes. But is it good? Heavens YES!